Heritage tourism is "traveling to experience the places, artifacts and activities that authentically represent the stories and people of the past." An embodiment of this working landscape is the Haw River Watershed, a 1,707 square mile area of farms, forests, cities, towns, and rural areas sandwiched between two major metropolitan areas: the Triangle to the East (Durham, Raleigh, Chapel Hill), and the Triad to the West (Winston-Salem, Greensboro, High Point). 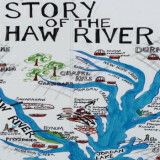 Haw River Map posted courtesy of the Haw River Assembly: www.hawriver.org. Click on map to view it at larger size. Responding to threats to its ecology and traditions, residents, civic groups, local businesses, and federal, state, and local governments have taken action to promote conservation, recreation, and historic preservation to ensure the Haw River Watershed remains the lifeblood of the region. A paddle trip down the Haw is a revelation -- a rich web of flora and fauna and natural and historical features -- allowing paddlers to experience the Haw as it was meant to be seen. Kayaking on the Haw River. photo courtesy of Silenteye Photography. "Conserving the natural beauty of the Haw River, and providing recreational opportunities for residents and tourists is more than a quality of life issue. It is an industry, capable of producing substantial revenue for small business owners, hotel and restaurant purveyors and local governments as wells as jobs for local residents. Further, a conservation and recreation based tourism industry is non-polluting, preserves rather than depletes natural resources, and serves to attract non-tourism based industries." This ideal of conservation through recreation was brought to fruition by a partnership among the state, five county and four municipal governments to form the Haw River Trail. 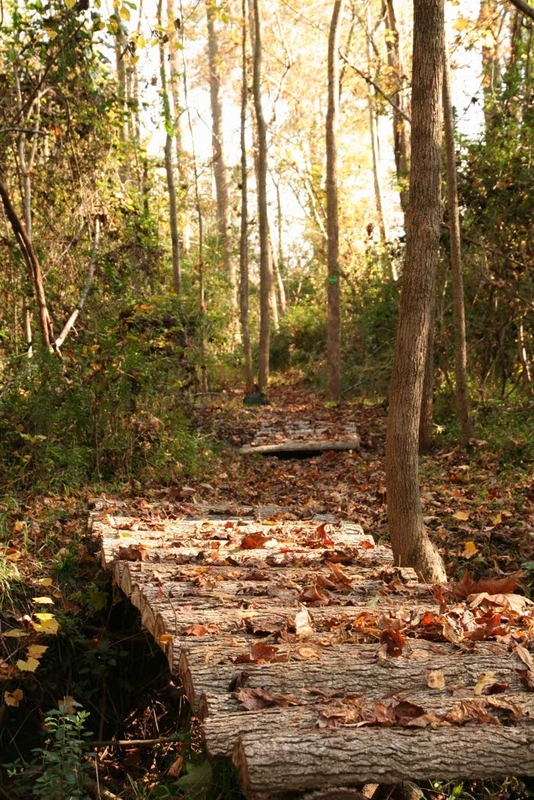 “The State of North Carolina has partnered with five counties and four municipalities in the Triangle and Triad on a multi-use trail, the Haw River Trail, connecting the Haw River State Park to Jordan Lake State Recreation Area. The Haw River Trail is as a component of the State Trails System to make efficient use of public dollars and provide the greatest benefit by linking key resources. The Haw River Trail Corridor contains a wide range of outstanding and unique natural, cultural and historic resources, existing and potential recreational and economic development opportunities and would support the multiple goals of the Partners. 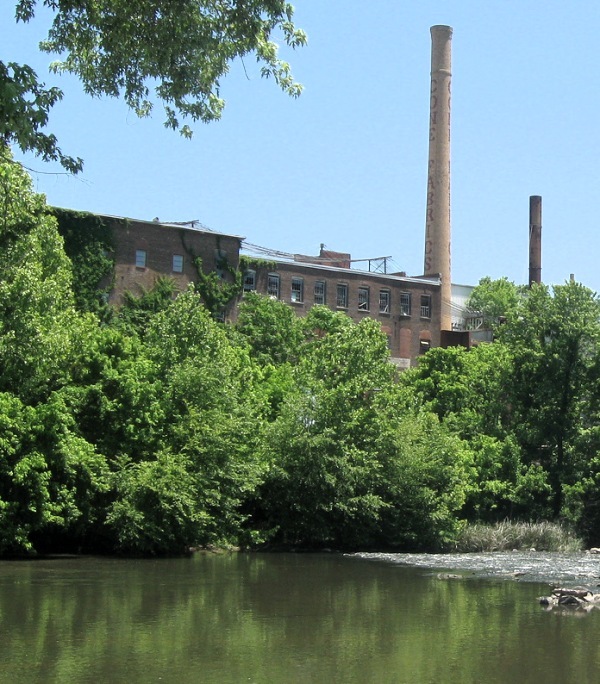 Half a dozen or more textile mill towns line the banks of the Haw River. Towns with evocative names recalling the histories of the native peoples of the Haw -- Saxapahaw, Altamahaw, Ossipee. The textiles mills once dominated the area’s economy but by the 1990s, due to changing global economics, most of the mills had closed and the mill towns struggled to survive. 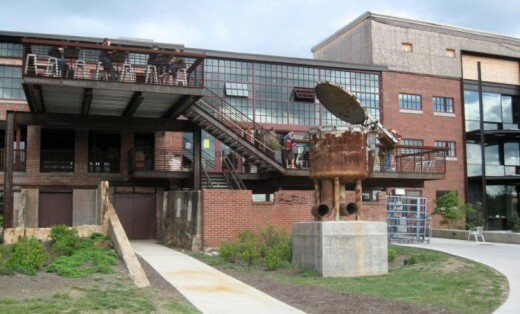 View of the Saxapahaw Rivermill, the restored Dye House and Cotton Mill. Photo by Deepa Sanyal. However, in recent years enlightened property owners and preservation organizations have begun to rehab mill homes and mill structures for a new generation of residents. and new uses such as condominiums, schools, retail, restaurants, and entertainment spaces have resulted. Glencoe Mill Village, and the Saxapahaw Rivermill are exceptional examples of historic preservation, rehabilitation, and adaptive re-use of 19th century mill buildings and mill houses on the Haw River. Mill towns like Saxapahaw and Bynum are celebrating their resurgence with festivals showcasing local arts, foods, music, and river recreation. Streams of people come to Saxapahaw on Saturdays all summer long, as it's a venue for farmers’ markets, front porch crafts, historic mill and farm tours, live outdoor bands, and paddling on the river. Bynum, a vibrant 19th century cotton mill village in its heyday, remains so today, even though the mill closed in the 1980s. 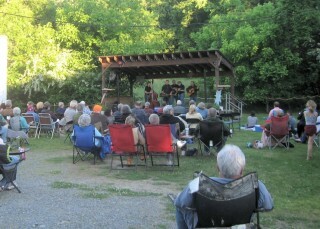 To celebrate and keep alive the community’s rich history, neighbors formed the Bynum Front Porch music series. Weekly music played by Bynum's General Store from May to August. This photo & photo below by Deepa Sanyal. 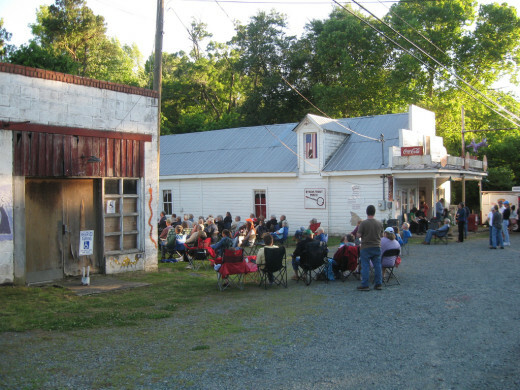 Every Friday during the summer, people come out to sit on the grounds of the Bynum General Store, listen to gospel, folk, blues, rockabilly, and bluegrass, talk with their neighbors, and watch the kids run around. Like California’s Napa and Sonoma Valleys, the Piedmont of North Carolina has its own American Viticulture Area (AVA), the Haw River Valley AVA. 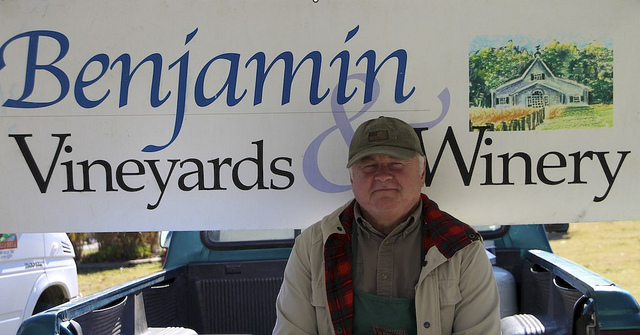 To promote and market its prize winning artisan wines and wine tourism, four Haw River Wineries & Vineyards - Benjamin, Iron Gate, Glen Marie, and Grove -- have come together under one common name -- the Haw River Wine Trail. The Haw River Wine Trail is a 45 mile drive through the Haw River Watershed, past farmland, mill towns, and Main Streets of Saxapahaw, Mebane, Graham, and Burlington. The drive offers scenic views, local arts and crafts, and a sense of history. Benjamin Vineyards & Winery. Photo by Marian Stanton; Flickr creative commons. 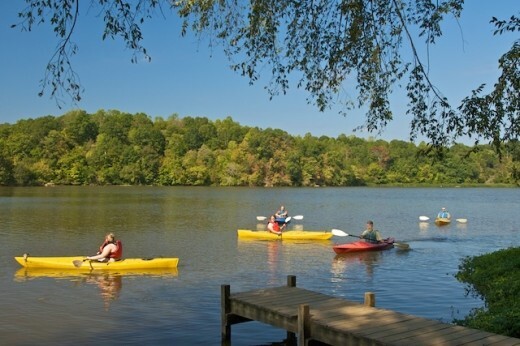 Wine tasting and paddling on the Haw also make for a perfect pairing. On a Saturday in May, the Grove Winery hosted the Upper Haw River Paddle with Haw River Canoe & Kayak. Patrons enjoyed a leisurely paddle down the Upper Haw River and returned to Grove for a patio wine dinner. Benjamin Winery near Saxapahaw is also an ideal wine tasting and wine dinner location, après paddle! "The mission of Cultural Tourism is to preserve and protect historic, cultural, and natural resources and by so doing, developing their potential for cultural tourism." 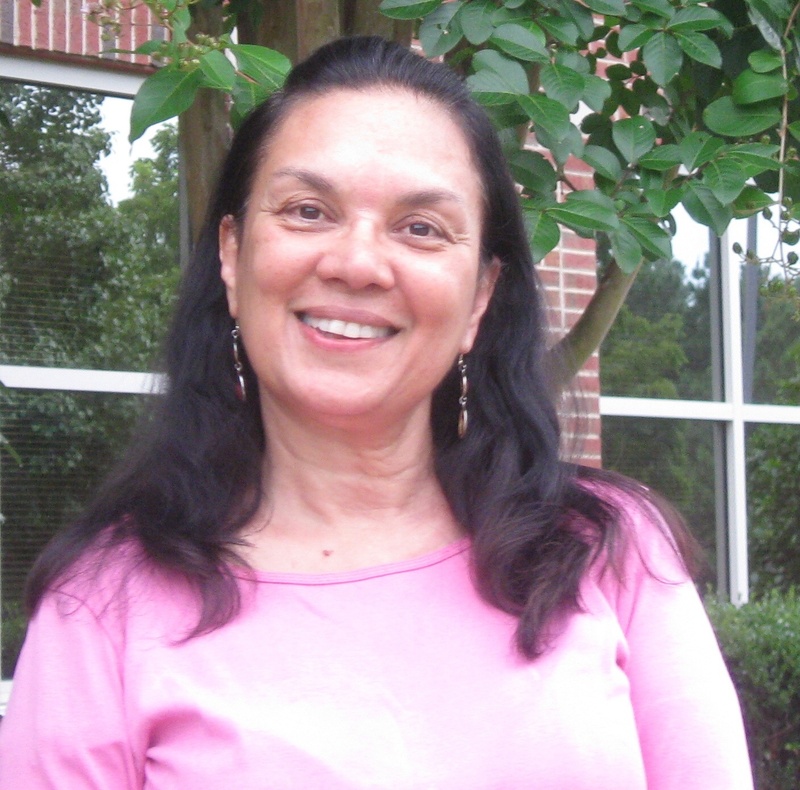 The revitalization of the Haw River Watershed does not come at the expense of the land or the culture, but comes because of them. 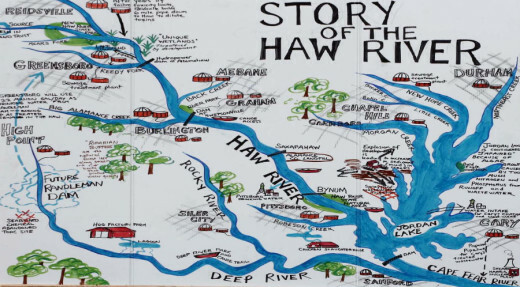 The communities working to revitalize the Haw River watershed -- the river, land, and towns -- have intentionally or serendipitously, adopted or followed many of the principles the National Trust advocates for beginning cultural tourism programs. They have assessed the potential and fit of their assets and collaborated to plan, prepare, and market these assets -- always with preservation, protection, quality, and authenticity in mind as they make sites and programs come alive. Hiking trail. Photo courtesy of Haw River Trail. This spring, the Haw River Trail added another trail easement, a first step on the six mile journey to connect Swepsonville River Park to Saxapahaw. A new paddle access to a beautiful stretch of the Haw River is being built. Attendance on the Haw River Trail between March 1, 2013 and May 31, 2013 was 74,535. In May 2013 the Haw River Trail was honored by the City of Burlington in recognition of efforts to preserve the character and interpret and celebrate the history of the Haw River. The Haw River Wine Trail Vineyards and Wineries continue to work together to host wine tasting events with the Haw River Trail and other partners. The collaboration is prospering according to Robert Cox,. 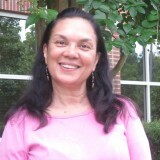 Alamance County’s Tourism Manager, who holds monthly planning meetings with the winery owners. 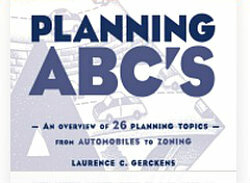 We welcome discussion of this article on our PlannersWeb LinkedIn group page. My Corner of North Carolina's "Triangle"
Is Transit the Answer for Congestion? -- Kathy's additional posts can be accessed from the sidebar in her first article listed above.